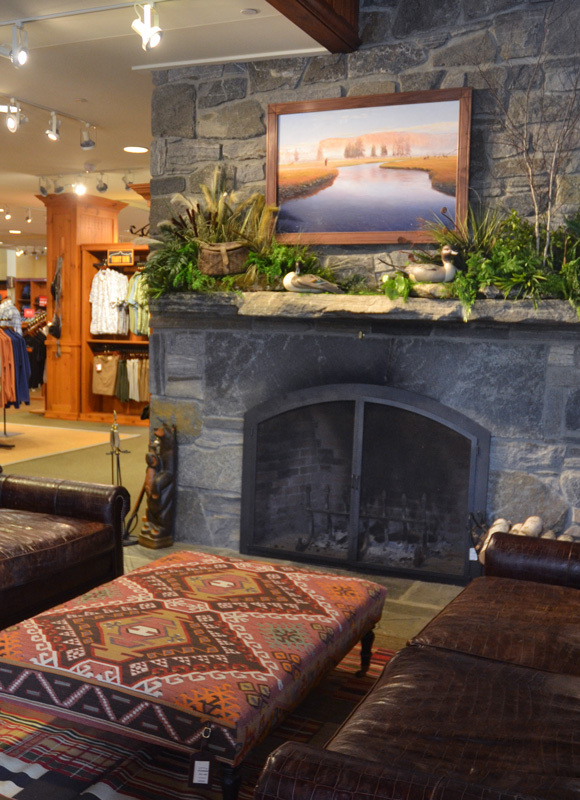 If you happen to pass by the magnificent Orvis flagship store on Route 7A in Manchester Center, VT during your Summer travels, make sure to stop and visit this unique and elegant store. One of my large paintings “Sharing the Morning” is currently hanging above this incredible stone fireplace located in the store’s main lobby. The original oil on panel measures 29″x44″ and comes framed in an exquisite carved custom-made mahogany frame created by Master craftsman Richard Sweeney. Enjoy the experience of browsing through the store with its collection of outstanding merchandise and make sure to go and see the huge trout swimming in the ponds at the back of the store by the fly fishing department. You’ll be amazed!!! 2 Responses to "An Elegant Affair In The Green Mountains"
I was just reading the new Gray’s Sporting Journal. Your painting “Sharing the Morning” is spectacular, beyond words. It is truly a special, special piece. I live in Kansas City but our family has a place in Bozeman. Sharing the Morning reminded me of our son’s favorite ranch north of Bozeman, where 16 mile Creek flows through their property. The neighboring ranch is also where a small portion of A River Runs Through It was filmed, and it has a valley that reminds me of your painting. Our artistic knowledge is limited, mainly consisting of a few Gorman lithos. We live in a southwestern syle home, so they were a natural. I am now going to show my ignorance regarding your work, as well as art, in general. Undoubtedly, the price of Sharing the Morning is way, way out of our price range. However, I was wondering if any reproductions have been or will be made of this piece, such as a litho. Thanks for your patience, and if this is a totally off the wall question, please do not feel the need to respond. I assure you that it will have no impact on my continued, immense enjoyment of looking at Sharing the Morning in Grey’s Journal. It was a pleasure to start the day reading your thoughtful comments concerning my painting. I’m happy that the work gave you some enjoyment. I make my living selling my art and sales are important to keep the family fed but receiving an e-mail such as yours is sort of the icing on the cake. It is what makes it worth while knowing that what I do touch someone now and then. I’m a born and raised New Yorker and lived most of my life in or near New York City. Back in the mid 80′s my wife and young son went to Yellowstone for the first time and I was hooked. We’ve returned dozens of times to paint, hike and fish and down deep it is where my heart is. We moved from the city ten years ago and Gardener was my first choice. Having one son who lives in Ithaca, NY, we (the wife that is!) decided that we should stay closer to him and so we settled on a small farm 3 hours north of New York City and not out west. My last trip west was two winters ago when I finally got to experience the Park in all it’s winter splendor. It was spectacular. We spent a wonderful day in Gardener and one in Bozeman. Over the past 30 years, I’ve worked with a number of galleries in that area. For years I showed with Trailside in Jackson and with Steve Zabel at Montana Trails in Bozeman. 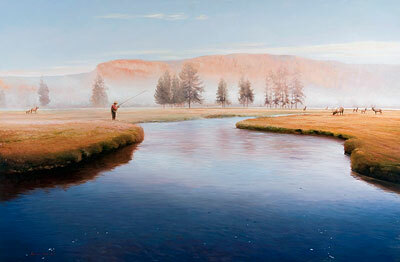 At the moment I show only with Banks Gallery in Bozeman moving more and more towards private commissions and sales. I have to be honest and say I envy the fact that your family has a ranch in Bozeman. It must be truly spectacular. Sharing the Moment is the Lamar Valley in Yellowstone in early fall. A truly heavenly place. The painting is quite large. The price of the oil is $16,000. But I do have a paper giclee print of it in a small edition of 99 signed and numbered copies. It measures approximately 11″ x 15″ and sells for $155. plus shipping. Naturally if you were ever interested in an oil of the area I can work on a smaller size. If you don’t mind, I can add your e-mail address to my mailing list. I know people are bombarded with e-mails these days and we try to keep the numbers to a minimum. I send out notices of up coming shows, available work and things that are happening with my work. If however you do not want to receive it please let me know. Again I want to thank you for your kind words.